ViewVo mentor, Tarryn Gorre, has spent the last few years successfully building her food-tech app business. In the interview below, Tarryn describes the journey she took to get where she is today – the successful CEO of Kafoodle, a food-tech company matching people to food within the contract catering, hospitality and healthcare space. While this sounds quite specific and niche, the journey of building an app is similar across all niches. 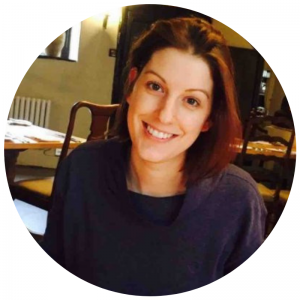 If you’ve ever considered building your own app, Tarryn has a wealth of valuable knowledge to help guide you through the important things you need to focus on. I was a sales and marketing manager and then consultant for the hospitality industry. 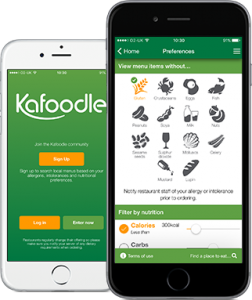 I’m the Founder of Kafoodle – a food technology software product to help restaurants manage food and menus for people with allergies. How did you feel in your work before you decided to make a change? 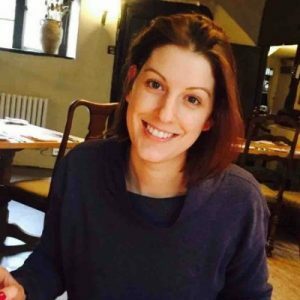 I’d worked in hospitality for nearly eight years and whilst I loved the industry, I was feeling more and more that I wanted to be my own boss and not be answerable to others. The main trigger for me was an opportunity. I had been thinking about either doing an MBA or starting my own business. As I was thinking, my friend Kim (who is now my business partner) approached me with an idea to develop an app to help restaurants deal with allergies. I knew I could throw my energy behind this and add a lot of value so we started doing our research. It was only when that started to show there would be a market for what we are doing that we decided to go for it. It was my last client. I just felt no matter what I did, he was never going to be happy with what I was doing. I was exhausted and found it just wasn’t fulfilling me anymore. I also felt I wasn’t being challenged. I looked back over my last 8 years and realised I was good at what I did, but there was no more scope for me to learn. How did you choose your new career? I think the circumstances almost chose me. I was drawn to this idea because I knew I loved hospitality, so knew I could add a lot of value. It wasn’t a hard leap for me, but it is completely different to what I was doing before. Designing a software product wasn’t exactly my comfort zone! Absolutely. I have no regrets whatsoever. What do you miss and what don’t you miss? I miss the camaraderie of a large team. When you work for an organisation, you are in it with a team: you work together and you play together. It sounds a bit of a cliché, but it can be lonely at the top. If it wasn’t for Kim I don’t know how I’d do this. I’m so happy I have her to celebrate and commiserate with. I also miss the structure. Running a start up means there is no one who has trodden this path before. Everyday, you deal with what gets thrown at you. Every day is different and each challenge is another story. It would sometimes be nice to just have a job where you know exactly what to expect and you can go on autopilot for a few days! We had the idea – but we needed to do lots of research. Every Saturday for 6 months, we got together at Kim’s house and spoke to as many restaurant owners as we could. My own knowledge of the industry was really useful and together we built up enough research and feedback to know we could make a go of it. The real kicker was taking on a chairman who helped us fund the idea and get things started. What didn’t go well? What ‘wrong turns’ did you take? I can’t list them all – I’d need pages! I guess the one which stands out most is making bad hiring decisions. We hired a sales manager and after 6 months, there still hadn’t been one sale. I wish I’d dealt with that quicker. However, you do realise you can’t get everything right. That just doesn’t happen. When you make mistakes, don’t take it too personally. We all do it – that’s how we get better. How did you handle your finances to make your change possible? I’ve been a bit of a saver all my life. By the time I got to the point of starting this business, I’d saved up enough money to do an MBA. I spoke to my brother about it (he’s a talented and successful investment banker). He advised I’d probably learn more doing my own business and it would probably cost less: MBA’s are expensive and, in addition to the course costs, you also have to fund your living costs for a year. So, I had savings behind me, but the main thing was I didn’t give up work. I carried on in my job for 6 months whilst Kim and I were doing the research on this. Probably starting without having any future or plan mapped out. It’s daunting and exciting in equal measure but it is hard getting over that barrier of not knowing what is in store. I use my own network and have four advisors who keep us on the straight and narrow! I’d really recommend ‘vapour selling’, which is where you sell something you haven’t created yet. You can go down the long and expensive road of building something and then finding out you have no market for your product, or you could sell the idea, get people to sign up for it and then, when it’s ready, deliver it to them. Be prepared to pivot! Our product is a completely different product to what we started off with, and it’s been constantly revised and developed. You have to be prepared to change and develop your product around feedback, so it really is true that you should go with a minimum viable product (MVP). Do your research, test and try things out and see how you feel about it and, if you can, test the market and see how it responds. I love my journey and would do it all over again, but it isn’t for everyone. I’ve signed up with ViewVo as a mentor as I’m willing to let others shadow me and learn what the life is like. If it suits then great, but learn before you go diving in, and shadowing others who have been there and done that is a message and vision I get on board with. Click here to find out more about Tarryn and the job shadowing opportunity she offers to help people build an app business themselves. Next Have you ever dreamed about starting your own craft business? Claire Gillespie, founder of successful craft business, Oglee Poglee, shows you how to make it a reality.